Hospitality offers students a better knowledge of jobs in the Hospitality field. The students learn how to complete job applications. Before going into kitchens, they go thru a short course on food safety. After reviewing names of utensils and cooking terms, the students begin cooking. Students use their skills to prepare and serve meals to staff. Housekeeping skills and simple sewing is also taught. All these things ca be applied at various jobs as well as at home. 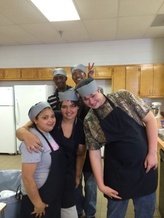 Students learn and become comfortable working in kitchen areas as well as doing housekeeping jobs. They learn of other possible jobs such as hotel engineering, front desk, building maintenance, and grounds keeping. Hospitality students become comfortable working with stoves, mixers, and microwaves. They learn how to read and follow recipes. They learn how to correctly measure liquid/dry ingredients. Students learn proper ways to sanitize before and after cooking. They practice serving staff members. Students also learn how to use a janitorial mop and broom, and how to clean glass and work tables. Along with all of this, students learn to thread a needle and sew a button on a shirt. A list of career possibilities would include cooks, servers, janitors, housekeeping, amusement park workers, lodging (hotels, campgrounds) staff, building maintenance, electricians, groundskeeper, airplane steward, staff on Amtrak and trains, etc. Hospitality class offers a certification in ServSafe, an educational course sponsored under National Restaurant Association Education foundation. Please contact the course instructor for more information.